Deon Meyer's new South African crime novel is in a genre more or less invented by Paul Cain in his only novel, A Fast One. The compression of time and action is so condensed (as in the title of Meyer's book) that the narrative is propulsive and addictive. Meyer's novel is not quite so bleak as Cain's, but it's pretty dark. Benny Griessel, who has been a major and a minor character in previous Meyer stories, is now an official "mentor" to a group of young black and mixed race police detectives (the new wave of police in the new South Africa), and is tiptoeing around his mandate to guide them without taking over their cases. One of the cases begins almost before the beginning of the book: a young American woman is on the run (literally, she's on foot) from a gang of thugs that we know little about except that they have killed another American, whose body is discovered and reported to the police. The other case begins with a corpse of a man shot to death and discovered by a housemaid, lying next to his drunken wife. As Griessel oversees both cases, shuffling his limited resources between them and dealing with the anxious police hierarchy, he's also anticipating a meeting with his wife, who had kicked him out of their house 6 months earlier and challenged him to stay sober for that length of time. He's sober now, but wondering what's to become of his marriage and his career under all the current pressure. There's violence, politics, social observation, police procedure, and vivid characters a-plenty, each serving to delay momentarily the speed that is the major factor in the reading experience. We know that delay, not resolution, is the real skill of the novelist (particularly the crime writer), and Meyer displays plenty of that skill here, along with his vivid evocation of place and personality in contemporary Cape Town. While one plot drives forward with motion rather than mystery, the other is more of a puzzle, and the cops involved in these separate tracks use quite different techniques and skills in the pursuit to which they are assigned, another testament to Meyer's command of the material and the genre. 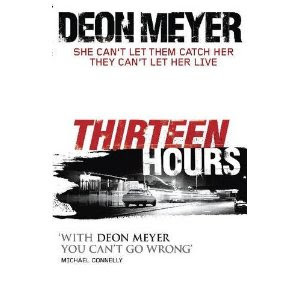 Thirteen Hours marks Meyer's returning once more to the police story from which he had departed in several recent novels, and yet another indication of his stature in the field is that he mixes up genres and strategies from book to book and within each story. While not every one of the books is to my taste, I'm happy to follow Meyer wherever his stories will lead, and I'm happy that his success has meant that his books are easier to get in English than they were when I first discovered his books in a Cape Town bookstore almost 9 years ago. I'd like to email you about an anthology of Irish crime fiction I edited but I can't find your email address. If you get a chance could you email me at - gerardforporesident (at) yahoo (dot) com - please? Glenn that is, not Glen. Apologies. I'd love to get your email address too. I'm interested in reposting this review to Wicked Writers (http://wickedwriters.com/). Please contact me at supriyan04@yahoo.com.